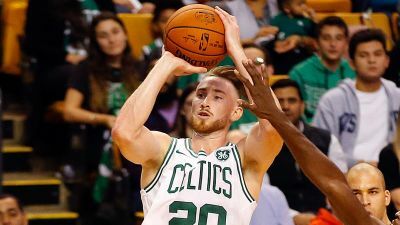 You can call Gordon Hayward a lot of things, but complacent isn't one of them. Most people - myself included - would probably spend a month or two on their posterior, watching Netflix after looking down and seeing their leg shattered and pointing in the wrong direction. After sacrificing one's body for work, one is entitled to some time to heal, and healing takes a different form for every person. The idea of getting my body ready to risk yet another such injury just three weeks removed from about as bad of an injury one can sustain on court without certainty your career is over however, well, let's just say that is not how I heal from wounds, and probably the majority of you all, too. Gordon, however, is chomping at the bit. There's a lot of a sports injury rehabilitation process that isn't exactly newsworthy. Breaking bones does a lot of damage to your body, even when it's clean like this one was. Muscles are often torn, and simple movements we take for granted become nearly impossible to accomplish without help...or a lot of patience. I'm talking about simple, necessary things, like going to the bathroom, or making a meal. I am most certainly not talking about playing basketball, or anything that could be considered such in even limited contexts. But to Hayward, this is an important part of his recovery, or so it seems. It's remarkable the Rockets and Celtics are on top of their conferences without one of their two best players (Chris Paul & Gordon Hayward). He's been dealing with the same stuff you or I would with a broken leg - albeit with a much better care team than most of us get to enjoy - but has decided shooting some hoops should be on the daily regimen as well. Don't get too excited, as he's got folks chasing down his rebounds and reportedly expects to miss the entire 2017-18 NBA season, but the wiring of a person who is so competitive they still want to get in shooting reps despite everything that's happened to him this month is very exciting, to me at least. Seeing what this team is able to do without such a competitive spirit and talent in the lineup only makes me drool about next season. This one's pretty interesting already.